Skittles candy was first produced in the United States in 1982. They are small, round, chewy, fruit flavored candies that are covered with a hard candy shell and have a white letter "s" printed on them. They are similar in size and shape to M&Ms and are also produced by Mars. 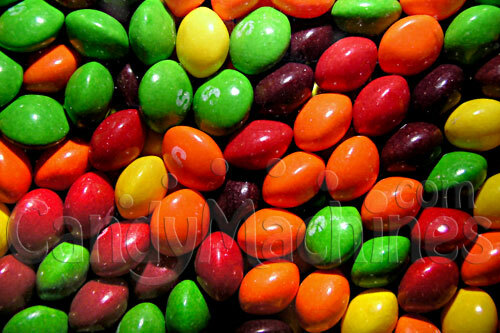 This assortment of Skittles candy has five different fruit colors and flavors including Strawberry (Red), Lemon (Yellow), Grape (Purple), Green Apple (Green), and Orange (Orange). Skittles candy is gluten free and gelatin free. Skittles are often associated with rainbows due to their vibrant colors and Skittles slogan is "Taste the Rainbow!". There have been several television commercials centering on imaginative scenes with people joyously receiving a bounty of Skittles candy raining from a rainbow in the sky. Our Skittles candy is available in either a 3lb bag, 20 lb case, or 40 lb bulk case. Need a machine to vend these fruity candies? Be sure to see our full line of candy vending machines. Don't forget the vending label with nutrition facts for your machine! from Denver Awesome deal, Super fast Shipping! Don't waste your money on Amazon and third party sellers. Way better deal here and fast shipping! Thank you!